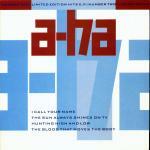 The UK 7"-release features a large blue block a-ha-logo and a smaller red logo on a dark blue background. A small multicolour band-shot by Just Loomis is placed in the upper right corner, while "I Call Your Name / A-HA" has been written repeatedly in dark blue on a red and light blue background across the top of the picture sleeve. The reverse features a similar set-up, the red a-ha-logo exempted. The small band-shot is different, but taken from the same photo session. Track listings plus the lyrics to "I Call Your Name" have been written in light grey and white letters. Finally a small advert for the "East Of The Sun, West Of The Moon"-album has been included in the lower right section of the sleeve. 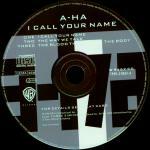 Both the single "I Call Your Name" plus the flip "The Way We Talk" are album-versions. The second 7" "Limited Edition Hits E.P. / Number Two" is released in the UK only. 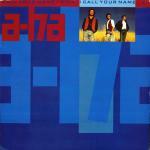 The front of the picture sleeve is white with a light blue block a-ha-logo and a smaller dark red logo. It has a fold out sleeve, with a black and white band picture on the inside flap The picture on the front of the normal 7" is placed on a dark blue background with a large blue a-ha-logo and the lyrics in white on the other side. The reverse of the sleeve is similar to the reverse of the normal 7", but with no album picture. The strip at the top is just dark red, no lyrics and a longer track listing. 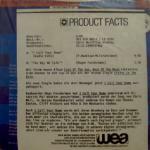 The sleeve of the promotional 7" is identical except for the occasional "Special DJ Edit"-sticker or stickers including phone numbers of WB-employees or WEA information sheet. The a-side features an edited version of the single (4:06) which seems the same as the album version except that it fades earlier, while the b-side of the promo contains the album version of the single. The track listing on the sleeve then does obviously not agree with the tracks actually on the record. The 12" has a similar sleeve to the regular 7" release. It includes the album version of "The Blood That Moves The Body" in addition to the tracks found on the 7". The 5" CD comes with the same front cover as the 7" single but the blue background design continues round the spine of the CD-insert. The titles on the spine are written in white. The reverse of the insert is dark and light grey with a large black a-ha-logo. The titles are in white and there is a picture of the album "East Of The Sun West Of The Moon". The German made CD is grey with a light grey 'block', a large grey a-ha-logo and a black strip along the top. All titles are in silver writing. It has the same tracks as the 7", plus the album version of "The Blood That Moves The Body". There is again a cassette single released in England which has a slightly different cover layout. The background is the large blue a-ha-logo which is written round the whole insert and the titles on the spine are in white. The front of the sleeve has the red a-ha-logo printed at the top and the picture from the 7" is printed underneath. "Cassette Single" is also written in red capital letters along the bottom The insert folds out with the tracks written in white and a small "East Of The Sun, West Of The Moon"-album picture. The cassette is black with white titles and plays the same on both sides. Brazil: A Brazilian DJ 12"-record comes in a grey and black WEA text sleeve. The disc features a-ha along with other artists. The German cassette single comes in a card sleeve. The front sleeve is similar to the UK release, but the cassette itself is transparent with white text and blue cogs. Mexico: The Mexican promo 7" has I Call Your Name on both sides of the disc. The title is written in Spanish as "Te llamo". The 7" doesn't come in a pictures sleeve.